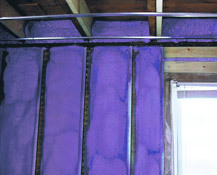 G & R Insulation uses WALLTITE ECO™, a product of BASF Canada. 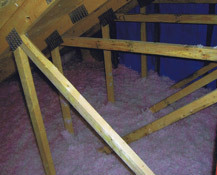 This product is sprayed in place polyurethane insulation with an Air barrier system. Continue reading to learn more about WALLTITE ECO™and it's benefits. WALLTITE ECO™ meets and even exceeds performance criteria. It exceeds the requirements of the National Building Code of Canada. In fact, WALLTITE air barrier systems are the only products available on the market today that have successfully met the polyurethane durabillity text of appendix D of the "Canadian Construction Materials Centre (CCMC) Technical Guide for Air Barrier Systems for Exterior Walls of Low-Rise Buildings." WALLTITE systems also conform to CAN/ULC-S705.1(including amendments 1 and 2). WALLTITE ECO™ improves energy efficiency. The system combines superior insulation performance with an industry-leading air leakage rating, it's seamless system requires no fasteners, WALLTITE ECO does not lose insulating performance to thermal bridging or convection looping. By maximizing the performance of the building envelope, WALLTITE ECO allows HVAC systems to operate more efficiently. WALLTITE ECO™ improves durability and structural strength with little design limitations. It has the ability to last the life of the building and withstand positive and negative wind pressures without displacement. It helps control vapour movement, reducing the risk of condensation, mold, moisture, ice damming, spalling and premature deterioration of building materials. In addition, testing conducted by the CCMC1 and the United States National Association of Homebuilders2 (NAHB) showed that closed-cell, spray-applied polyurethane foam insulation systems like WALLTITE ECO actually increase structural strength. When applied between wood and steel stud wall panels onto gypsum board and vinyl siding, closed-cell foam increased rack and shear two to three times. It also increased racking strength 50% when sprayed on oriented strandboard (OSB). The only limitation is your imagination. Domes, turrets, curved walls, multi-story atria and cathedral ceilings—all are possible with WALLTITE ECO. As a spray-applied system, WALLTITE ECO offers tenacious adhesion to almost any substrate and almost any shape. It will not shrink, sag or settle over time. WALLTITE ECO™ improves safety, comfort and health. It creates a draft-free, airtight building envelope that prevents the infiltration of pollutants, toxins and allergens. It also helps to prevent the growth of mold and fungi by controlling the movement of moisture and vapour through the building envelope and helping to eliminate condensing surfaces. Testing has proven that WALLTITE ECO does not off-gas any harmful toxins of volatile organic compounds (VOCs) after installation and indoor air quality is safe for occupancy 24 hours after the application. WALLTITE ECO™ is environmentally responsible. At every stage of its lifecycle, it uses less energy during production than traditional insulation materials3. As a lower density, closed-cell foam, it takes less material to produce the performance you need. It burns less fuel during transportation because it’s transported as a liquid, then expands 32 times its volume during application. WALLTITE ECO is also economically responsible. Labour accounts for a large portion of the cost on any project. WALLTITE ECO provides three integral systems in one application—insulation, air barrier and vapour barrier (depending on the way it’s applied and where it is installed). Steps are reduced and so are labour costs. As a spray-applied, fully self-adhering system, detailing is less complicated so it also installs faster. 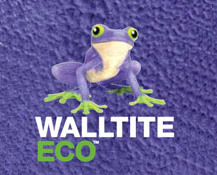 WALLTITE ECO™ uses bio-based, renewable, and recycled materials. It uses polyols made of recycled material. In order to obtain EcoLogoM certification, WALLTITE ECO contains significant rates of recycled content. Polyethylene terephthalate (PET) is among the most common plastics used for packaging, bottles and containers. Post-consumer and post-industrial recycled material is processed to make raw material for new applications like WALLTITE ECO. Other eco-friendly products used include polyols from castor oil, which do not need to be chemically processed, to enhance the performance of the spray foam. Considerations for selecting renewable raw materials to replace fossil fuel based resources include availability at competitive prices and suitability for industrial applications—all without compromising food production and depleting natural resources. For WALLTITE ECO, BASF Canada chose to use renewable content from non-edible crops that do not jeopardize global food production. This is an important step in the continuous improvement of BASF products, with the goal of including more bio-based content while enhancing product performance. WALLTITE ECO™ uses zero-ozone-depleting blowing-agent technologies approved by the United States Environmental Protection Agency’s Significant New Alternatives Program to meet the requirements of the Montreal Protocol on Substances that Deplete the Ozone Layer. BASF was the first polyurethane manufacturer in Canada to meet Montreal Protocol requirements with the development of its zero-ozone-depleting polyurethane foams for industrial pipe and tank applications. WALLTITE ECO boasts a near-zero global warming potential (GWP) score. WALLTITE ECO™ environmental impact with third party varification. WALLTITE ECO™ can help your project to achieve LEED® points. WALLTITE ECO™ comes with a warranty and proper training. When you chose WALLTITE ECO, the contractor will provide you with a minimum two-year warranty. Our third-party warranty program for all WALLTITE CCMC approved materials also provides an additional warranty up to $ 25,000 per project. If you’re not satisfied, Morrison Hershfield completes a thorough inspection. BASF also provides a two-year limited product warranty from the date of installation.An in-field quality assurance and control program is part of our CCMC approval. As a third-party resource, Morrison Hershfield Limited one of Canada’s leading multidisciplinary engineering and management firms certifies our training program and provides follow-up review of installers in the field. The WALLTITE ECO quality assurance program calls for periodic audits of the installers to ensure you get a quality end product. BASF products are found in almost every aspect of building and construction—from roofs and ceilings to floors and foundations, from walls and windows to doors, trim and coatings, to roads, bridges and levies—contributing to the highest levels of energy, environmental and economic performance. The comprehensive BASF product line for building and construction is strengthened with access to global R&D resources that contribute to the development of new products, as well as continuous improvement of the existing product portfolio. Not just a leader in its industry, BASF is a global leader in sustainability and corporate social responsibility. The company is included in the Innovest Global 100 list—among the world’s most successful companies in the areas of environmental protection, social affairs and corporate governance. BASF is also listed on the Dow Jones Sustainability Index, the FTSE4Good Index and Storebrand SRI Funds. With the goal of promoting energy efficient homes, WALLTITE ECO has been used to meet the stringent energy performance requirements for the following homes participating in Canada Mortgage and Housing Corporation’s EQuilibrium™ (Net Zero Energy) Sustainable Housing Demonstration Initiative: ÉcoTerra™, Now House™ and Alstonvale Net Zero Energy House. In addition, WALLTITE ECO has been used in the Maison Pur Énergie net-zero energy home, as well as the Greenpeace Canadian Headquarters. Similar projects are underway in other areas, including Germany, Minneapolis, New Jersey and the rejuvenation of the East Parkside neighborhood of Philadelphia. Under a partnership with the United Nations, BASF is providing much-needed technologies for tsunami relief projects in India and Sri Lanka. In China, environmental futurist William McDonough is using BASF technologies to help build seven new cities over the next 12 years, with housing for 400 million people. As part of the Gulf Coast rebuild, BASF has been in discussions with those charged with the restoration of the Gulf Coast area after Hurricane Katrina. Visit HighPerformanceCommunity.com for more information.